Back around Day 6, we discovered that our stone structure continues in a straight line where we originally thought it would curve into an apse. It only continued for about a metre before disappearing into lower layers, so we proposed that it may still be an apse – just a larger one than we thought. It turns out that our structure doesn’t form an apse at all, so far as we can tell. Instead, it continues straight towards the Benedictine Abbey. We found a continuation of the wall in the northern extension, badly damaged by modern landscaping and stone robbing. It still does not curve and must be at least 10 metres long. Well, for one thing, it means our structure probably isn’t the early church. The structure is far too large for what we know of early churches, and rounded corners are unheard of in early medieval Scottish churches. But that doesn’t mean our structure isn’t interesting or exciting! It is currently the oldest stone structure we know of on Iona and the earliest stone structure associated with a church in Scotland. But even more interesting is that this structure is large enough to possibly be the ‘magna domus’ or monastic Great House mentioned by Adomnán in the late 7th century, where the monks would have lived and worked. 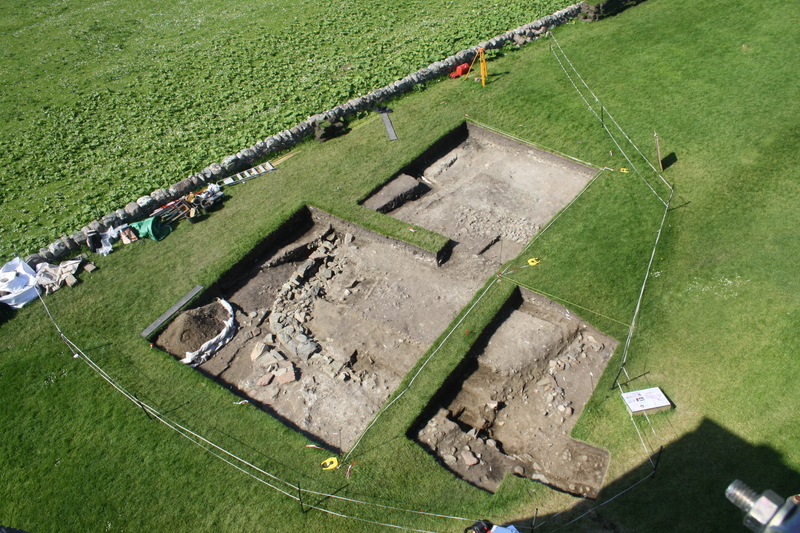 If our structure is the Great House, then it could provide a large amount of information about the daily lives of monks in Scotland during the early medieval period. Love getting your updates. I stopped by to talk to you on the day you discovered the wall and were considering the possibility that it may be the Great House. So it’s exciting to find that it’s still a possibility. Loved watching you work and chatting, thanks for being so accessible and information. Look forward to the next news. Are you pulling out a corresponding volume of domestic bits supporting the “great house” theory? Previous Previous post: Day 25: That’s a Wrap!